One of the most simple appetizers we've ever made were a big hit at our Christmas Eve party, mostly due to the awesome product we found at the CT Food and Wine Festival - Mariah's Chow Chow Relish. Amy had a nice chat with company founder and CEO Phyllis W. Haynes who takes a lot of pride in her amazing relishes and who created her company's tagline, "Relish What You Eat." 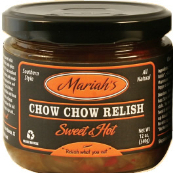 Available in four flavors, Mariah's Chow Chow Relishes are made with fresh vegetables and plenty of savory spices for a Southern style relish that packs a flavorful punch. They are an all-natural product made here in CT without preservatives or artificial coloring. One taste of the "Sweet and Hot" and we knew we had the perfect ingredient for one great party bite - "Chow Chow Phyllo Bites." We filled phyllo cups with plain goat cheese and topped them with a spoonful of Mariah's Sweet and Hot Chow Chow. No baking necessary, done in five minutes, and they flew off the plate. Plus, the red and green colors in the relish were very festive. Here's to easy appetizers! Remove phyllo cups from package and set out on serving tray. Fill phyllo cups with desired amount of goat cheese and top with spoonful of relish. Enjoy! Always in search of an easy app...and these look delicious. Chow chow is a PA Dutch staple down here in Lancaster County. My dad lives it. My kind of appetizer. Do you ever find your phyllo cups go soggy fast with stuff like this or is it just me?